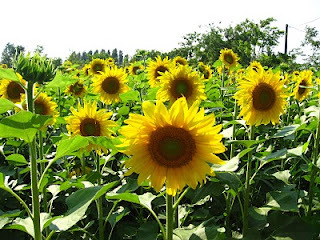 Sunflower cultivation can reduce our oil import bill. HomeSunflower cultivation can reduce our oil import billSunflower cultivation can reduce our oil import bill. Sunflower production in the country is expected to be higher this year because it can now be sown in the rice belt of upper Sindh, where floods have increased fertility, a veteran farmer said on Tuesday. The sunflower crop is likely to fetch more than Rs60 billion when cultivated on an area of 1.5 million acres, Sindh Abadgar Board President Abdul Majeed Nizamani said. He said sunflower is cultivated on nearly 400,000 acres of land in lower Sindh. �We can also grow sunflower on 1.5 million acres of land in upper Sindh now. Rabi crops will not need much water this season, he said and added that the floodwater brought silt with it and reduced salinity. Nearly two million acres of crop, mostly paddy, worth Rs60 billion, was washed away by floods in recent weeks. In the Rabi season, the land that was inundated by floods may not be suitable for wheat crop, but appropriate for sunflower cultivation, said Nizamani. Average production of sunflower in the country is 360kg per acre and its current price is Rs1,800 per 40kg. Thus, the total earnings stood at Rs16,200 per acre. �It cannot help us recover all our losses, but it can provide some relief,� he said. If 13.5 million tons of sunflower produce is used to extract oil at solvent plants, it could yield 38 percent oil. The revenue would reach around Rs60 billion in terms of foreign exchange savings at an average price of Rs112,500 per ton of oil, the farmer said. Solvent plants are established in Karachi, Hyderabad, Thatta, Kunri, Sukkur and Multan.